With only a few ingredients, these Air Fryer Chinese Salt & Pepper Chicken Wings are big on flavor, like you get from an expensive Chinese restaurant! These seriously taste deep fried, I am not kidding. As you may or may not know, it is tradition for the hubs and I to order a nice dinner from our favorite Chinese Restaurant for Christmas. It’s a Jewish thing. 🙂 Since moving back to California, we cannot find a really good Chinese restaurant in our area. We keep trying different ones. What we have noticed, however, is that Salt & Pepper Pork Chops are really popular and we have had them from several restaurants. We finally found a Chinese restaurant that we like, well, good enough, anyway. The last time we ordered, I asked the manager what the ingredients to the Salt & Pepper Pork Chops. I figured I could use my Air Fryer and make them myself. Surprisingly, there are very few ingredients. Salt, pepper and Jalapeño peppers. Well, duh! 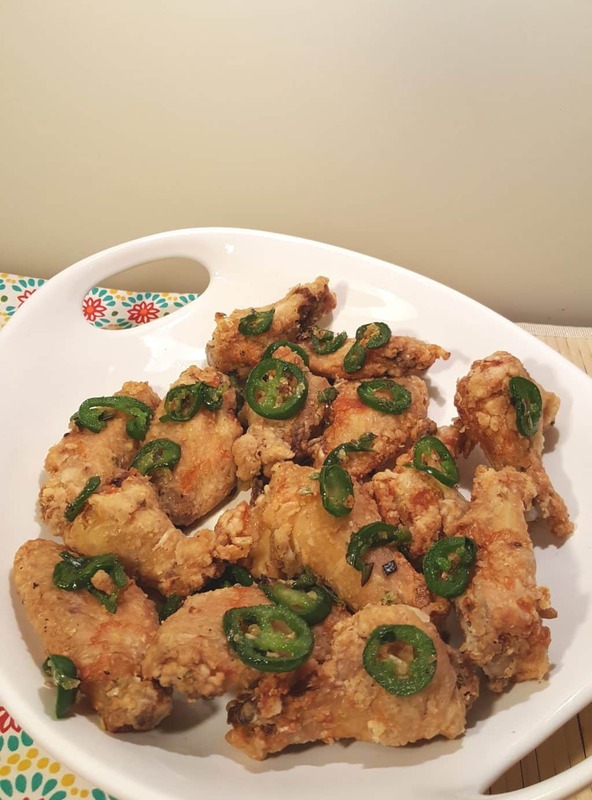 Since Friday is Wing Night in my house and because I am having so much fun creating new flavors of Chicken Wings in my Air Fryer, I decided to make Air Fryer Chinese Salt & Pepper Chicken Wings instead of Pork Chops. I have to tell you, I am not a Jalapeño fan, but since Salt & Pepper Pork Chops are so popular here, I had to try them anyway. Oh my gosh, so good in this recipe. The stir frying of them, give them a mild and really delicious taste. Even my husband, who first pushed them aside, tasted them (after I pleaded with him) and then kept eating them. In a medium bowl, add the egg white, salt and pepper and Whisk until very frothy. As usual, my Rösle Stainless Steel Flat Whisk gets the job done, in no time flat! See what I did? Dry the Chicken Wing parts and add them to the Egg White mixture. Let the wings marinate for at least 20 minutes. You might as well prepare the vegetables while they are relaxing in their Egg White bath. 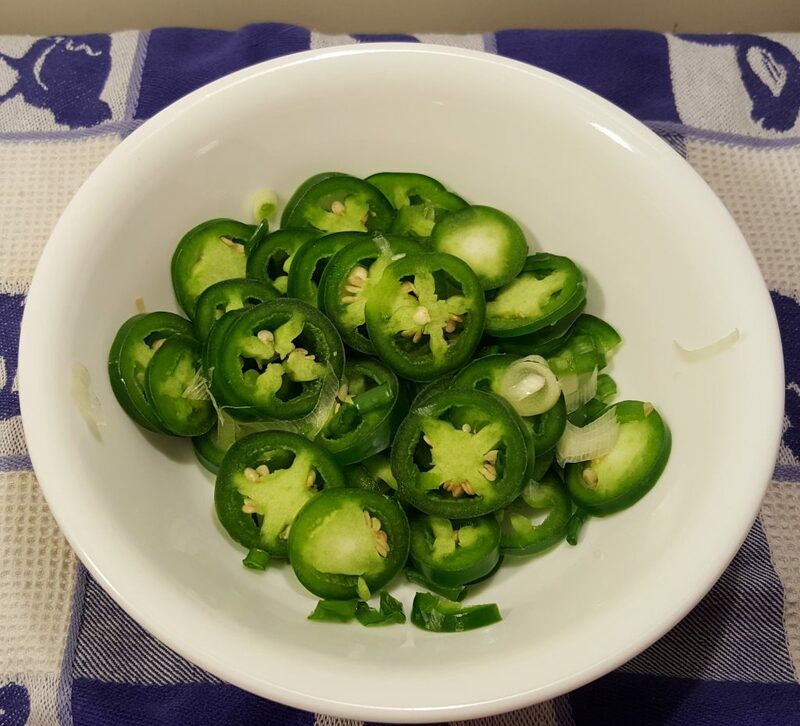 Trim the Jalapeños and thinly slice them. I am a big wuss, so I removed most of the seeds. If you want a spicier dish, leave in some of the seeds. Slice and chop the Scallions. Some people call them Green Onions. I’ve always called them Scallions. Set aside the veggies for now. When your wings are on the homestretch, you will quickly Stir Fry them and then add in the Chicken Wings. Believe it or not, once the Jalapeños are Stir Fried, they really aren’t all that spicy at all. In fact, they are rather delicious. 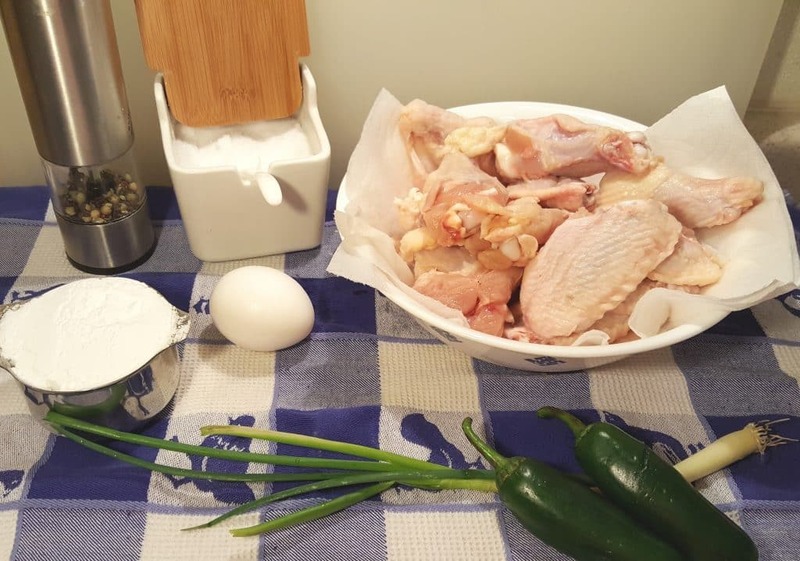 Transfer the Chicken Wings from the bowl with the Egg White mixture to a large mixing bowl. Pour in the Potato Starch and make sure the Wings are coated very well. Use Silicone Tongs, not your fingers to handle the wings. You want to make sure that the Potato Starch does not gunk up and get sticky. You also don’t want to scratch your Air Fryer. If your Tongs get gunked up, make sure to wash the gunk off and dry them well before continuing. 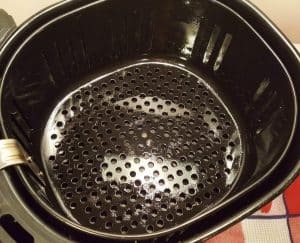 Please see my article on How to Prepare and Properly Season Your Air Fryer Basket. 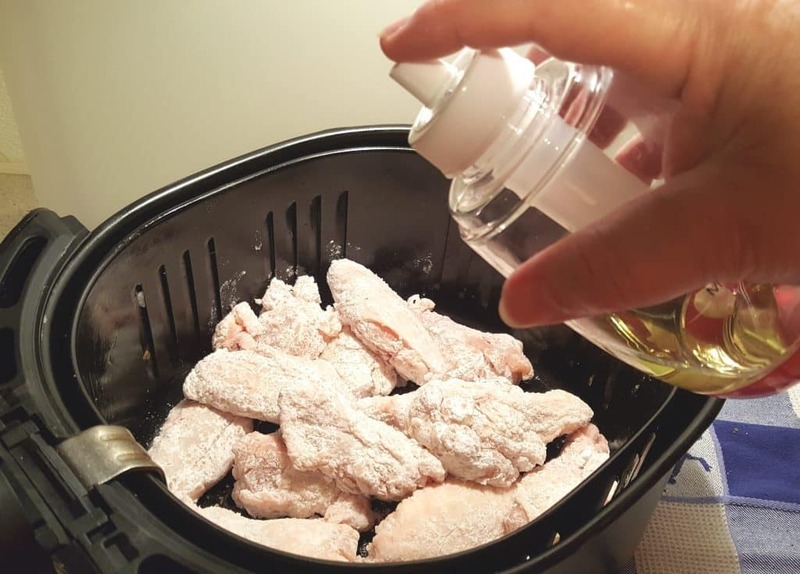 Using this method will help to prevent your Air Fryer Chinese Salt & Pepper Chicken Wings from sticking to the basket. Shake off any excess Potato Starch and place the Chicken Wings in your prepared and seasoned Air Fryer Basket. You can see that my basket is glistening from the light coat of oil. This will help prevent the coating from getting stuck to the Air Fryer Basket. I don’t normally spray my Chicken Wings with Oil, since the skin has enough oil to crisp up the wings. For this recipe, however, I did spray the Chicken Wings very lightly with Avocado Oil. My Oil Mister of preference is the Fine Life Brand. It is a bit pricey, but it works really well. Place the Air Fryer Drawer and Basket into the Air Fryer and cook for 25 minutes. 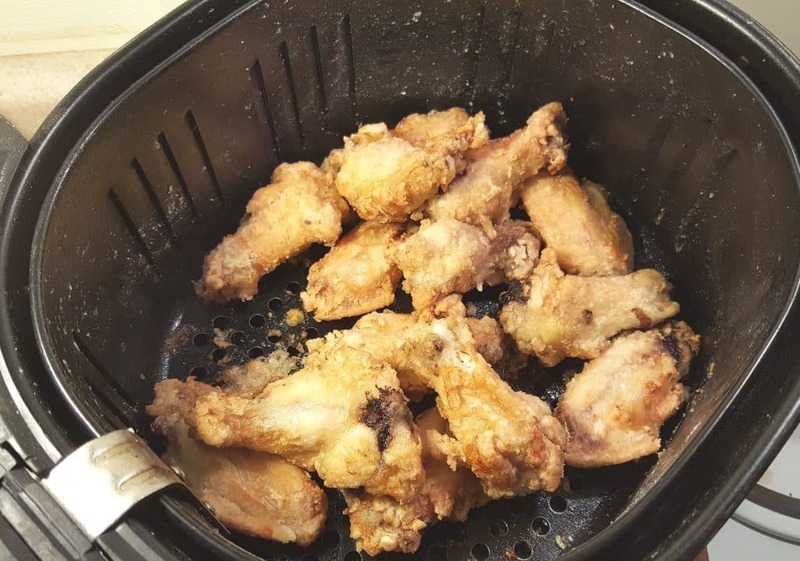 Shake the Air Fryer Chinese Salt & Pepper Chicken Wings every 5 minutes. Shaking often will also help to prevent sticking. 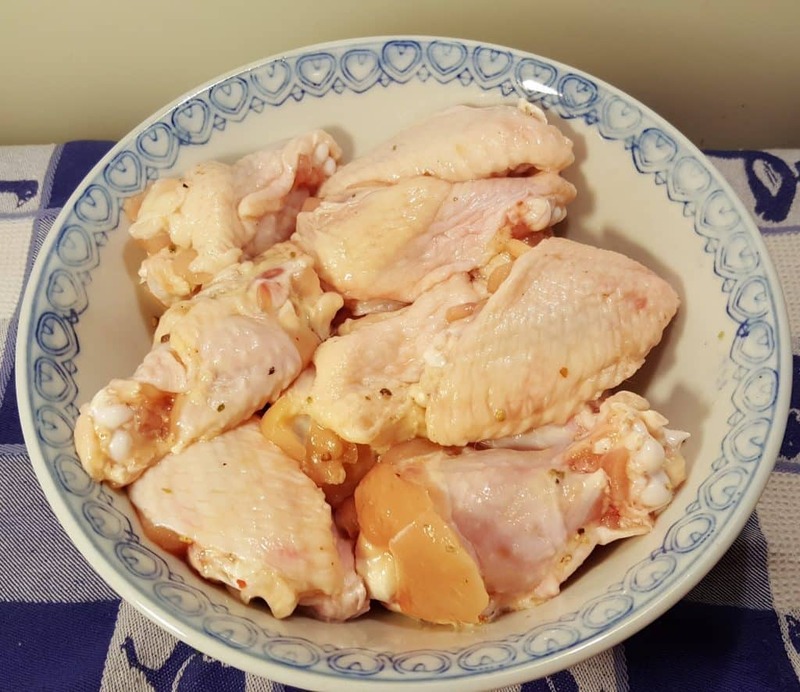 After 25 minutes, your Chicken Wings will look like the above photo. Turn up the temp for 5 more minutes. While the Wings are getting their final cook, it is time to Stir Fry the topping. This will go fast, so, before you turn up the temperature on your Air Fryer, preheat your Wok or Cast Iron Skillet. You want it screaming hot. Add a couple of Tablespoons of Canola or Peanut Oil, the prepared Jalapeños and Scallions and some more salt and pepper. Using a Spatula, Stir Fry the veggies for about a minute. 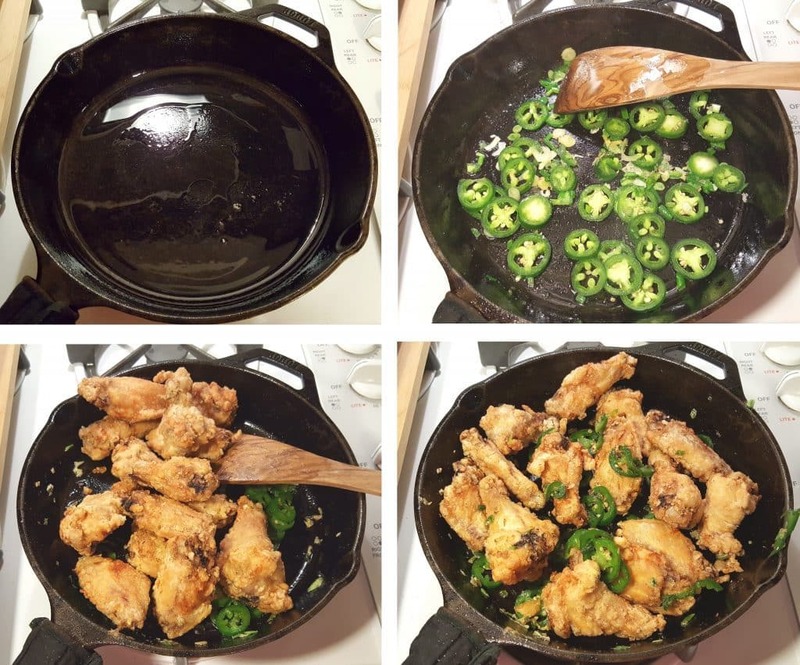 When the Air Fryer beeps, carefully remove the hot Chicken Wings and place them in the Wok or Cast Iron Skillet and coat with the Jalapeños and Scallions. Most of the oil will absorb into the Jalapeños and Scallions, so your Air Fryer Chinese Salt & Pepper Chicken Wings will not be greasy. 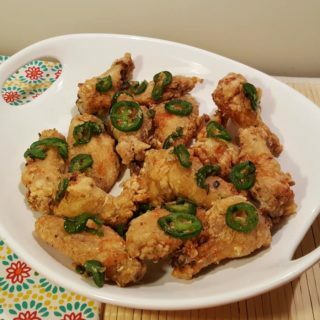 When I served these to my husband, he took a bite and looked at me and said, “they taste just like the ones we get from the restaurant.” I mean they are Chicken Wings, not the Salt & Pepper Pork, but, you know what I mean. If you like these, try my Air Fryer Chinese Salt & Pepper Pork Chops, which are fabulous. These Air Fryer Chinese Salt & Pepper Chicken Wings pair nicely with my Pressure Cooker Chinese Orange Pepper Chicken and Thai Triple Coconut Rice. 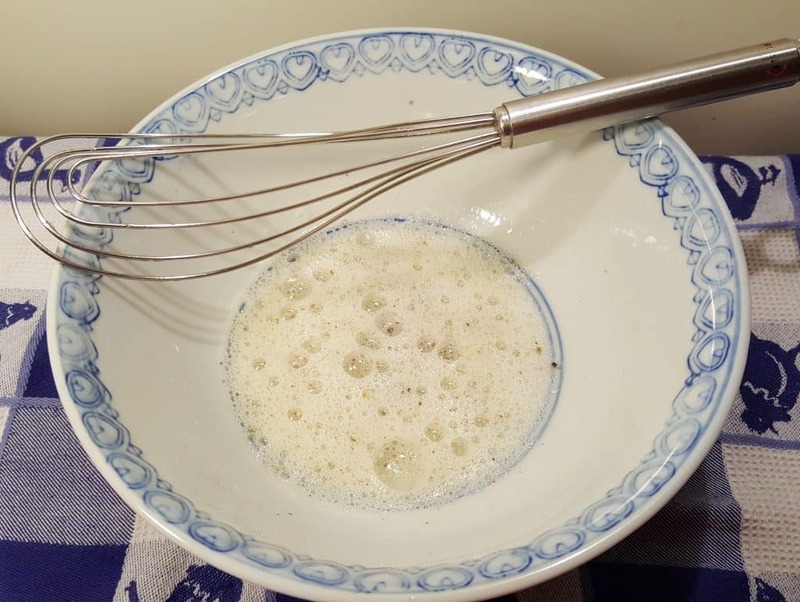 In a medium bowl, whisk together egg white, salt and pepper until foamy. 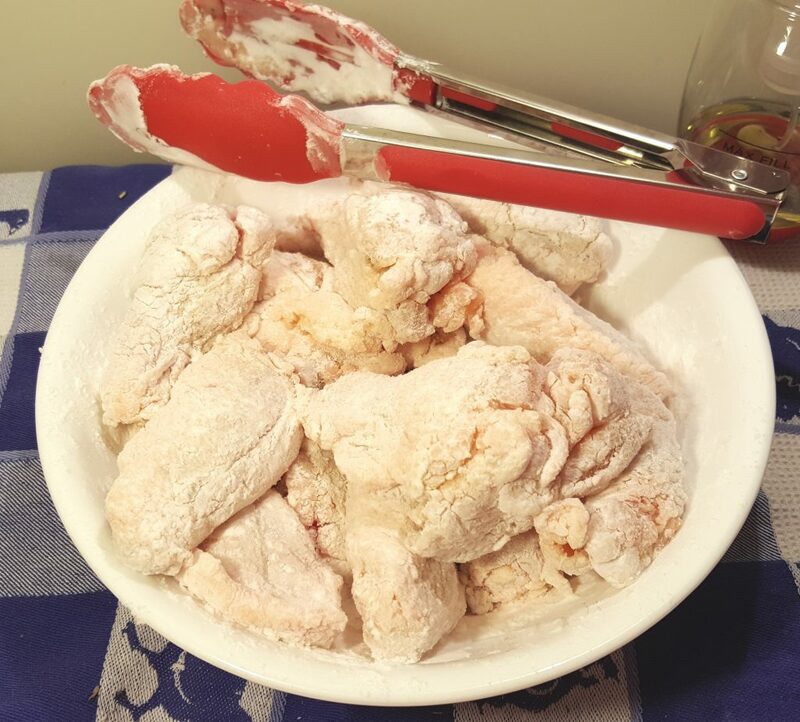 Pat dry chicken wings and add to egg white mixture. Coat thoroughly. Marinate for at least 20 minutes. 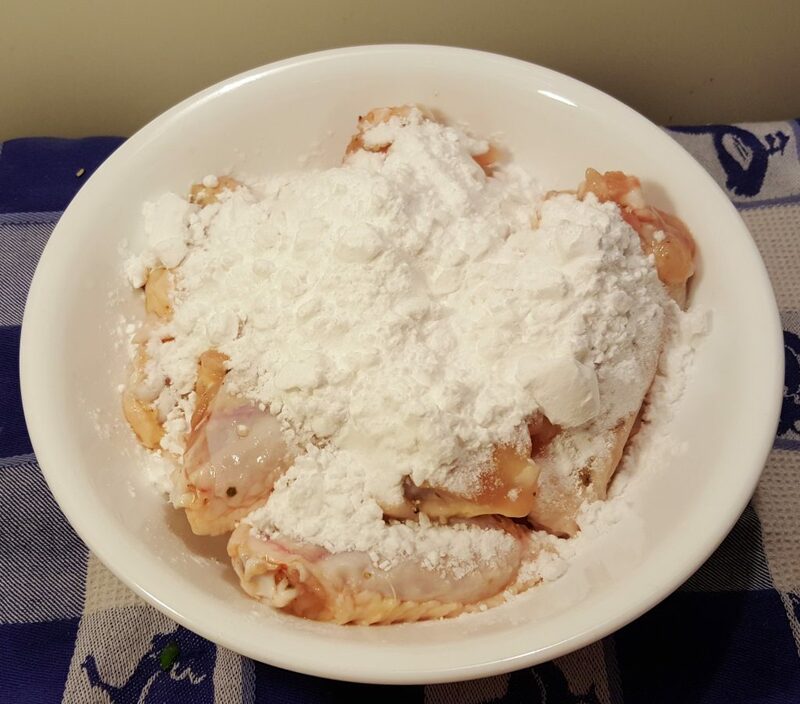 Transfer chicken wings into a large bowl and add Potato Starch. Dredge the wings through the Potato Starch thoroughly. 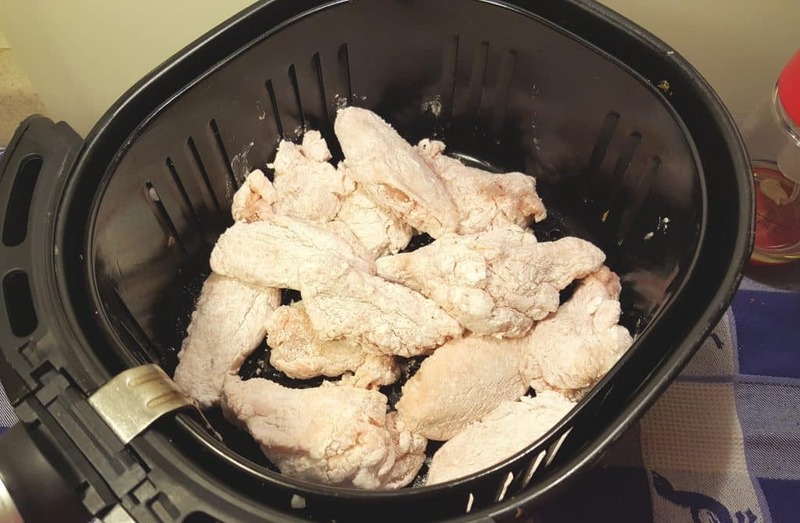 Shake off wings and place them into prepared Air Fryer Basket. Lightly spray wings with Oil. Cook at 380 degrees for 25 minutes, shaking the basket every 5 minutes. Cook an additional 5 minutes at 400 degrees, or until chicken wings are nice and brown. Heat wok or skillet until screaming hot. Add oil, jalapeño peppers, scallions, salt and pepper and stir fry for about a minute. Add air fried chicken wings to the wok or skillet and toss with the jalapeños and scallions, to coat. Stir Fry for another minute. 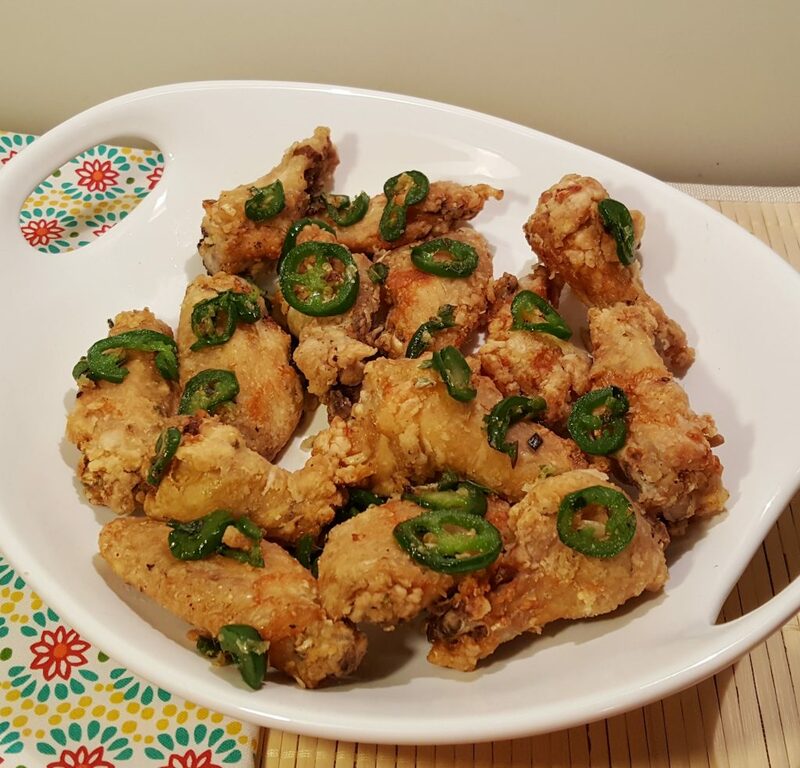 PIN this Air Fryer Chinese Salt & Pepper Chicken Wings! So glad you liked these wings. They are one of my most favorite recipes. What temperature do you set your airfryer to? Is potato starch and potato flour the same thing? 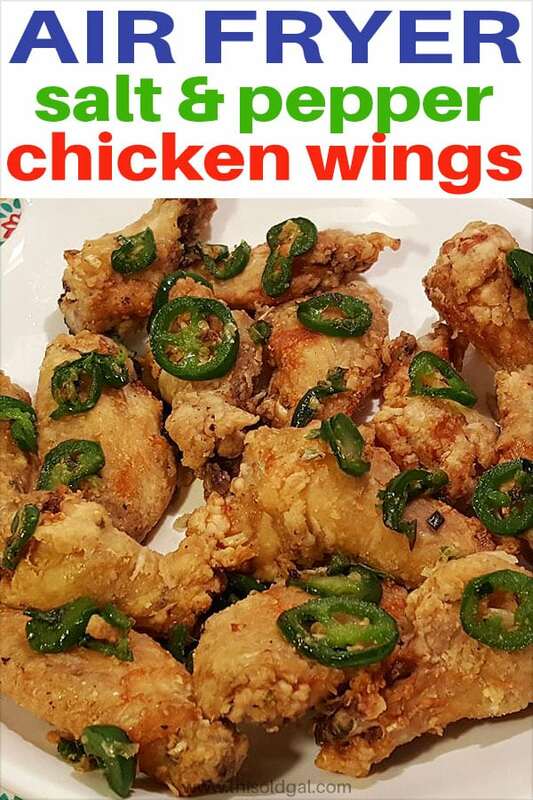 This is a very good recipe….I loved the wings. Very tasty !!! Would you recommend a sauce or something to go with this? Hi Jill could you please explain why you use egg yolk to marinate and the benefit of whisking it? Thank you! I don’t own an air fryer but would love to try this recipe. Can I bake or fry? What do you recommend? Thanks! I CANNOT FIND POTATO STARCH, CAN I USE SOMETHING ELSE? Made these tonight and they were a bit with the whole family. Thanks for the recipe!! I’ve been making this recipe for over a year now. I make the jalapeno stir-fry as a side for many dishes and it’s so good on tacos. Thank you!